Our Christmas cards, Calendars and other lovely gifts are now available on our online shop. 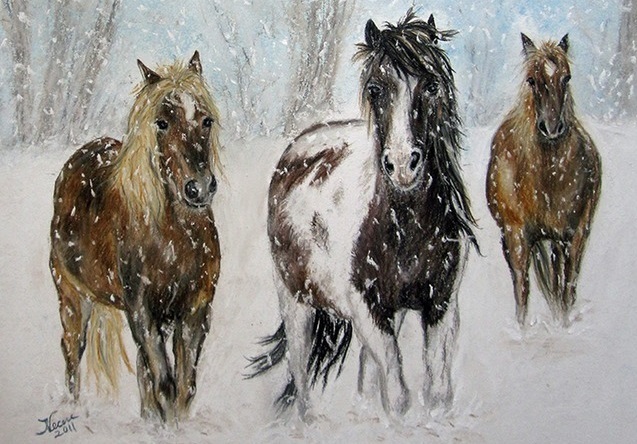 This years Christmas Card is Snowy Day by Teresa Vecere. All items can be safely and securely ordered online, which helps us cut down administration time enormously. Of course you can still order by phone on 0131 445 6257 (Mon to Fri 10am – 2pm) or by post. A copy of our Christmas order form with a limited selection of our merchandise is included in our Autumn Newsletter which will be with you shortly. We also have some gorgeous EGSF hoodies in Hot Pink and French Navy coming very soon. They are priced £27 and come in sizes XS to XL. Please support our shop and help raise funds for grass sickness research – and tell your friends! !